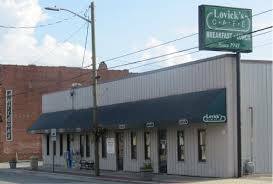 Lovick’s Café is a family owned and operated restaurant in downtown Kinston serving a homemade breakfast and lunch. The breakfast menu has many of the local southern favorites such as pancakes french toast, fresh country sausage, omelets, eggs to order. Enjoy one of the many the daily lunch specials. Entrees consist of hot hamburger steak, meatloaf, pork chops, barbeque chicken, fried chicken, and tasty chicken pastry. Have had breakfast many times, enjoyed lunch a few also.